View More In Mathematics & Counting. A beautiful new city is being made near the hills. At the launch meeting, we have you, the budding mathematicians, engineers, artists and visionaries to build roads to connect it. Use your math skills to master mountains, build tunnels and make long bridges over new lands. You can also improve existing roads. The longer the road, the more points you earn. So what are you waiting for! Get...set...build. Instead of letter tiles in spelling games, you will use number tiles to make math equations. Starting from a basic arithmetic equation like 2+3=5, you can make very complex, long equations. Kids develop a completely new way to look at numbers. Perfect game to combine skill and imagination. Hours of non-stop fun for sure. At Logic Roots, we are passionate about Math and work with the vision of Reinventing how kids practice Math through gamification of its concepts. 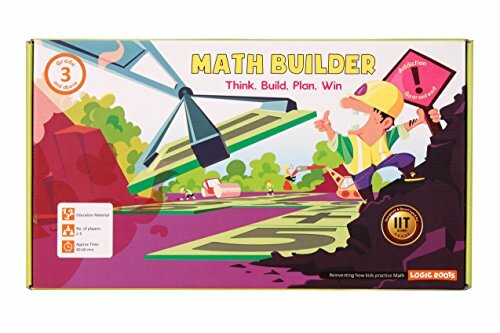 Our Board Games, Card Games and Apps are widely used by top schools and homeschooling parents to help their boys and girls fall in love with Math. These games are best used for Learning, Education and gifting purposes for children. Collaborative game play for kids: A game play built around cooperation and collaboration. Develop math equations as you build 4 arithmetic skills of addition, subtraction, division and multiplication. Math scrabble designed just for kids: 7 times more math practice at the same time compared to traditional class time and better retention. Math time equal to fun family time: Lots of fun for the entire family. Perfect way to spend an evening bonding over math and fun. If you have any questions about this product by LogicRoots, contact us by completing and submitting the form below. If you are looking for a specif part number, please include it with your message.